The LMS / LNWR Swingbridge is one of only two scheduled swing bridges in England and is the last significant hand operated main-line rail Swingbridge in existence in Britain. This scheduled monument sits on either side of the short length of the Sheepwash Channel, which links into the Oxford Canal, and is today within the Rewley Park residential development and close to the high-level railway bridge. The Bridge was originally constructed to designs by Robert Stephenson in 1850-1, and appears to be the earliest moving-element railway bridge in Britain to retain its original mechanism and the only one designed by Stephenson to retain the majority of its original structure. It’s low level hand operation enabled it to be constructed quickly and connected the LNWR passenger and goods station to the south (now at Quainton) with the LNWR locomotive depot and lines to Bicester and Bletchley, to its north, and enabled this line to cross the Sheepwash Channel whilst atill allowing the boats to pass when the navigation of Oxford’s waterways was of such importance to industry in Oxford. Around 1890 the bridge was substantially reconstructed in steel and the majority of the surviving structure visible today dates from this period. Further modifications to the north and midstream abutments were made in 1941. From October 1951 all former LNWR passenger trains were diverted into the GWR Station, following the failure to implement a new lift bridge in 1944 and the Swing Bridge fell out of use. 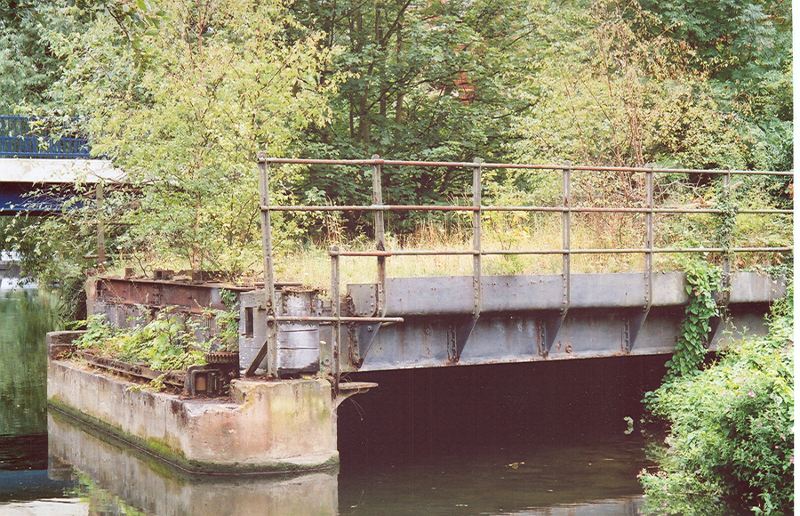 In 1984 the goods depot closed and the remaining rails on the Swingbridge and its approaches were removed soon after. At this time the approaches to the north and south were given over to the Rewley Park residential development and the bridge permanently fixed in its ‘open’ position, allowing navigation of the Channel.